Somehow I've managed not to post anything about what we've been doing this last term, though I do partly know why. For some reason google is not logging Gabriel out of his blogger account, and so I am unable to log in. Though last week DH suggested I use a private window and so here I am. Our final term has been filled with all sorts of interesting outings and experiences, and this week (where Arden is on holidays, and Willow and Gabriel are finishing up) has been a little more relaxing and busy all in one. Arden turned 9 on Monday, and we headed out to Petition for breakfast to celebrate. 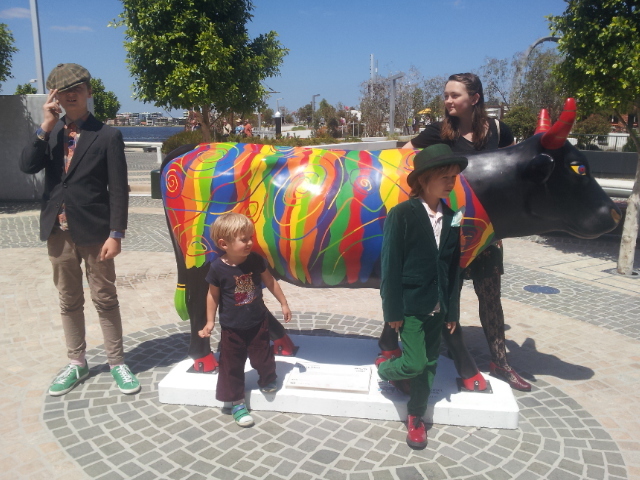 Damien headed off to work, and we went to Elizabeth Quay for a walk, where we found a rainbow cow. 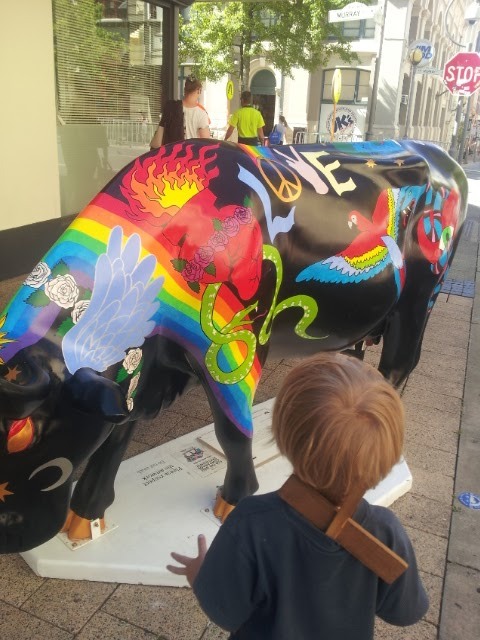 Gabriel, Irving, Arden and Willow with the Perth Cow! Perth has been doing its own cow art exhibition this past 6 weeks or so, and we've been trying to get out and see most of them. Irving has been loving it; and we were lucky enough to come across a public art painting of one,which Arden, Irving and I participated in. The rest of the week has been busy with me writing homeschool reports for our review and sewing and ballet. Our homeschool review was this morning and is over and done for another year, and likely next week I'll sit down to plan year 10 with Gabriel and year 4 for Arden. At this stage we're still waiting to hear if Willow will be offered a place at WAAPA; she did her test and audition last week, and she is currently semi-impatiently waiting to find out! I spent yesterday afternoon sewing myself a skirt to wear to the ballet (just finished in time) and unfortunately hadn't gotten to photograph it before Arden accidentally dripped oil on me whilst at Jamie's on the way home from the ballet. This year's Christmas ballet was The Nutcracker, and it was quite beautiful all round. We all enjoyed it, and they did a good job trying to cultivate the feel of a European Christmas.